Photo courtesy of Ying Duan. Found at a Singapore ramen shop. The god fire is hot enough to burn your bush! In the flame of the father, the son and the HOLY SH*T! Ramen. 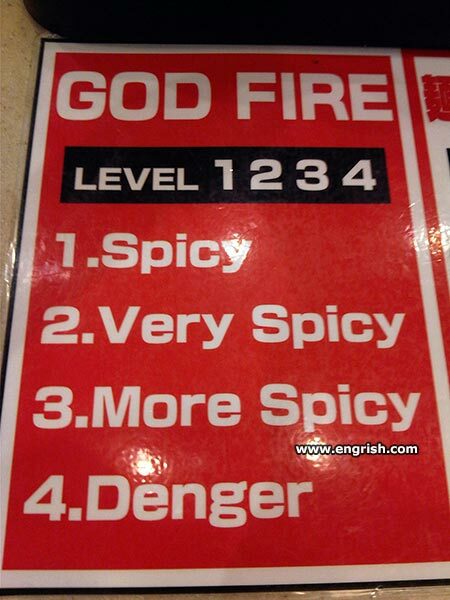 #4 could cause flame to shoot out of your donger! They keep playing Dies Irae after serving the ramen. I’ve heard of fire and brimstone preaching, but this is ridiculous. I think Very Spicy is more spicy than More Spicy. Testes very hot after eating. Ian Paisley: :And there will be weeping and wailing and gnoshing of taeth. LOL: “But Mr Paisley.” I don’t have any taeth.”. Oh I see, these are fire distinguisher instructions! People tend to get very religious while eating this ramen. They start screaming things like “Oh God! Oh Jesus Christ, God almighty!” Usually you say grace *before* you eat. Singepore . . . the renown fine city.